Join the Referral Bonus Club! For every friend or family member you refer who signs up for our OmegaXL auto ship program, you will receive a $25.00 check in the mail. Being healthy has never been so beneficial, so don’t waste a minute and start sharing the amazing benefits of OmegaXL today! Great Health Just Steps Away! – Repeat with new friends and other family members as often as you like! To take advantage of this program or for more details, please call 1-866-472-2240. *Offer available only in the United States. *Offer may change or expire at any time. 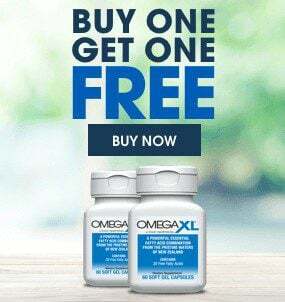 * If for any reason you are not completely satisfied with OmegaXL, simply return the unused product within 90-days of your initial order date for a refund (minus shipping and handling). No refunds will be issued for returns after the ninety (90) day period. © 2019 Great HealthWorks Inc. All Rights Reserved. Offers subject to change or cancellation at any time. ** Larry King is a paid endorser of OmegaXL. a fish oil containing a standard EPA (18%) and DHA (12%) omega-3 fatty acid blend in ethyl ester form.